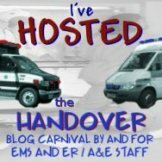 If you havent already seen it, Ambulance Driver is the host for this months ‘Handover’ blog carnival. This month brings together some of the biggest names of the EMS Blogoverse to share the jobs they have had that make the difference when caring for thier patients on Christmas Day instead of being at home with their family. There are some excellent and Festive reads in there. Click this link to visit AD’s site and find all of the links. P.S. Next months is the First Anniversay of ‘The Handover’. Time has really flown this year!